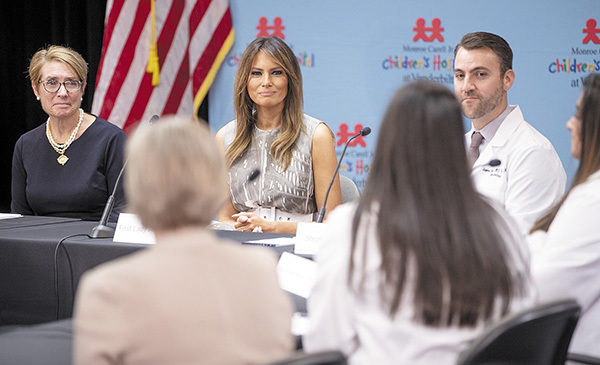 Last month, First Lady of the United States Melania Trump flew to Nashville as part of her 'Be Best' platform and visited the Monroe Carell Jr. Children's Hospital at Vanderbilt where she engaged with young patients and participated in a roundtable discussion on neonatal abstinence syndrome (NAS). Recent research by Vanderbilt found that in areas of the country disproportionately affected by the opioid crisis, treatment programs are less likely to accept patients paying through insurance of any type or accept pregnant women. Focusing on four Appalachian states - Tennessee, Kentucky, North Carolina and West Virginia - the study found that while 91 percent of programs were accepting new patients, only 53 percent outpatient buprenorphine programs would treat pregnant women. 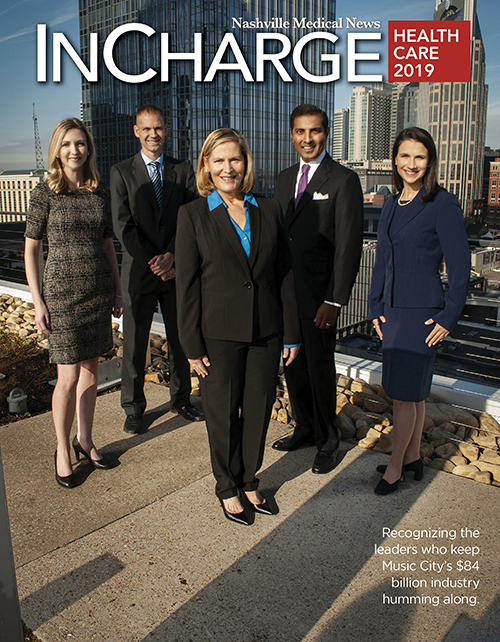 A review of TennCare data shows a sharp increase in incidence rates of NAS in Tennessee in just under a decade. The state saw more than a 500 percent increase from CY 2008 to CY 2016 in NAS infants. In 2008, 264 TennCare newborns were treated for NAS during the year. By 2016, that number jumped to 1,357. 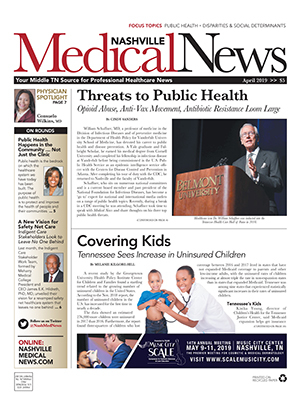 East Tennessee has been the most heavily impacted, but all areas of Tennessee have seen incidence rates on the rise. Vanderbilt has launched a collaborative program across all units of the medical center to change the way nurses and physicians care for newborns diagnosed with drug withdrawal symptoms at birth. Team Hope utilizes an interdisciplinary team, which seeks to improve the care of the opioid-exposed mother-baby dyad through multifaceted, family-centered approach. Team Hope has instituted evidence-based practices in the care of these infants to improve their outcomes, decrease length of stay and improve consistency of care for opioid-exposed infants. A spokesperson for the first lady said she was impressed with the work being done at Vanderbilt to keep mothers and children together and asked how she might use her role to help with those efforts. The Pediatric Emergency Department at The Children's Hospital at TriStar Centennial has just celebrated its first anniversary of service in Middle Tennessee. Opened on July 24, 2017 to support the growing needs of a growing city, the pediatric ER held a birthday party to mark the completion of a first successful year. Physicians, staff and administrative leadership were also celebrating the good news on their patient satisfaction scores. In the second quarter of 2018, the pediatric ER had the highest patient satisfaction scores for all of HCA in the Hospital Consumer Assessment of Healthcare Providers and Systems (HCAHPS) survey, which measures patients' perspectives on hospital care. The department was also ranked in the 98th percentile of all hospitals in the country that participate in the survey and 99th percentile in the state. Last month, The Children's Hospital at TriStar Centennial also announced a new program to better care for young patients with sensory sensitivities. The pediatric ER and the Kids Express Clinic are both piloting autism and sensory friendly rooms to help ease anxiety and provide a smoother experience for families. The sensory-friendly rooms feature adaptable lights, monitor and sound control, specialized toys and visual storyboards to help prepare patients for procedures. The launch of the program also included staff education in Autism Spectrum Disorder and sensory challenges, which included training in best practices for communicating with sensory sensitive patients. A form is available for families to fill out upon arrival to alert the staff to a child's specific communication abilities and stressors. Tennessee Action Council (TAC) is collaborating with the Tennessee Department of Children Services on a program providing 'Love Totes' for children in foster care. 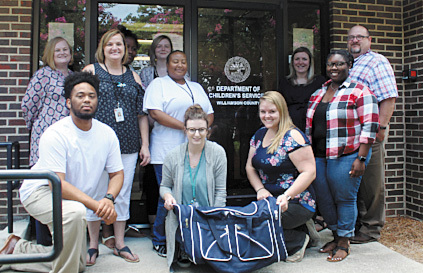 Helping Hands, a division of Tennessee Action Council, is providing 'Love Totes,' a large gym bag with multiple compartments, pouches, carry strap, and an identification badge with the child's name to provide them a sense of ownership. The 'Love Totes' replace the standard issued black garbage bag for moving children within the foster system. The organization is also providing foster children with personal hygiene items including toothbrushes, toothpaste, and bath products. "The truth is, when a child gets moved from one home to the next, and all they have is stuffed into a trash bag, it doesn't take too many moves until a child begins to think they are simply a piece of trash," said Rodney Duncan, spokesperson for TAC. "The 'Love Totes' are created to give the children a sense of identity, build a child's self esteem and help them relocate with something that is theirs." This new program is starting in Middle Tennessee in the counties of Williamson, Robertson, and Cheatham. The TAC team is working to raise funds for the next step - the Mid Cumberland Region, which includes the eight counties around and including Davidson County. Statewide there are approximately 8,553 children currently in the state foster care system. The Metropolitan Development and Housing Agency (MDHA) recently received a $3.5 million grant from the U.S. Department of Housing and Urban Development (HUD) Youth Homelessness Demonstration Program to assist unaccompanied youth and young adults. The grant program supports a wide range of housing interventions including rapid rehousing, permanent supportive housing, transitional housing and host homes. During Nashville's winter shelter season, community partners identified 353 individuals aged 18-to-24 who utilized designed youth emergency shelters. Looking at a single evening, the 2018 Point in Time Court found 81 youth and young adults were in emergency shelters or on the streets during that one night. "Ending youth homelessness is about building community for young people who are without a permanent, safe place to go and may have never learned what having a home means," Judith Tackett, director of the Metro Homeless Impact Division, said. "Through this grant, our Nashville community is making a commitment to our youth and young adults who are 23 years of age or younger and who struggle with homelessness. We will listen to you, we will hear you, and we will invest in you." Nashville is one of 11 communities awarded funding last month. The grant application was a joint effort of MDHA in collaboration with the Metro Homeless Impact Division, the Oasis Center and 21 additional local community partners, including Metro Nashville Public Schools, Tennessee Department of Children Services, the Youth Action Board, and the Metro Juvenile Justice Center. Honestly, don't puppies make everything better? There is plenty of research showing that pets make human lives healthier and happier. For many families, that benefit will soon come at a time and place they probably never expected ... during their child's hospital stay. 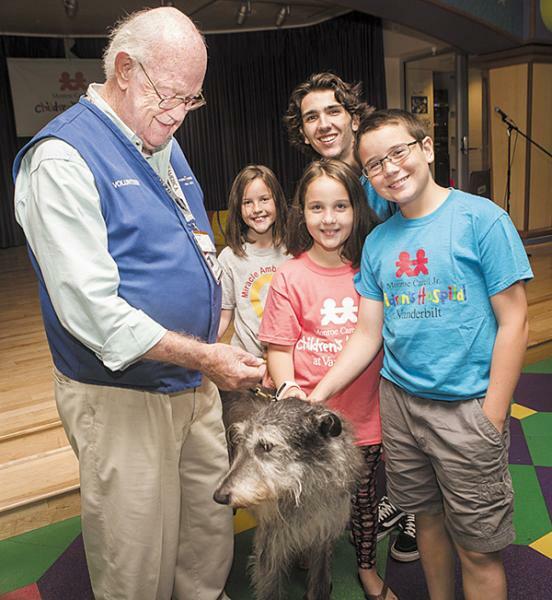 Members of the Christison family surround pet therapy dog Will and his handler, Bob Wilkins. In mid-July, Mars Petcare and the Monroe Carell Jr. Children's Hospital at Vanderbilt announced a collaboration to create the Mars Petcare Pet Therapy Fund to support a dedicated facility dog and staff position at the hospital with a goal of showing how pet visits improve the health of patients -- thus getting them home faster. The partnership comes as part of Mars Petcare's BETTER CITIES FOR PETS™ initiative, which aims to bring the healing power of pets to more children and families nationwide. "While the benefits of pets have been well documented, never before have we studied the positive impact of a facility dog on the length of a patient's hospital stay or the cost of care," said Mars Petcare North America Regional President Mark Johnson. The announcement was made during the hospital's annual dog show, the "Dog Days of Summer Paw-ty" for patients and families, which featured a dog show and meet-and-greet with several pet therapy dogs and hospital volunteers. "We are so thankful to Mars Petcare for affording us the opportunity to add a facility dog to our team. Facility dogs are experiencing much success in children's hospitals across the nation," said Janet Cross, administrative director of Patient- and Family-Centered Care. "The facility dog will add a new tool for normalizing a child or teen's environment, reducing anxiety and alleviating fears, and distracting from difficult experiences for short periods." In addition to helping patients, Cross said the facility dog will offer a source of strength and support to healthcare professionals, as well. A key component of this effort is to collect data that demonstrates the health, well-being and economic impact a facility dog, used as a therapeutic tool, can have on patients, families and staff. The facility dog is slated to arrive at Children's Hospital in early 2019. Matthew Walker Comprehensive Health Center (MWCHC), Nashville's oldest nonprofit health center, has partnered with Pearl-Cohn Entertainment Magnet High School (PCEMHS) and opened a new clinic on the school grounds. The collaboration provides a full-service medical clinic that is available to students and staff of PCEMHS from 8 am-2 pm every Monday and Wednesday, with expanded hours planned for the coming semester. The partnership between MWCHC and PCEMHS is the latest development in an effort to provide quality and immediate healthcare options throughout the region. The goal is to help staff and students remain healthy, thus improving attendance and educational success. The clinic is staffed at all times with a medical assistant, nurse practitioner, and operations administrator. Services offered include physicals, vision tests, hearing tests, and more, with dental and behavioral health services to be offered at a future time. MWCHC also plans to open clinics at PCEMHS's sister schools, Buena Vista Elementary Enhanced Option and McKissack Middle Prep, in future years. TriStar StoneCrest Medical Center recently celebrated the grand opening of the StoneCrest Baby Café in the Medical Office Building Classroom. This new option provides pregnant and breastfeeding mothers a friendly and comfortable environment to learn more about breastfeeding. In the Baby Café, mothers can relax, share tips and techniques, and socialize with other moms. One-on-one help from specially trained health professionals is available, including professional lactation support and WIC peer counselors. Babies can be also weighed and breastfeeding assessed to provide additional support for parents. Baby Café USA has over 45 free drop-in sites around the United States, supporting more than 2000 moms a year. This is the first Baby Café to open in the state of Tennessee.